WORK is proceeding on time to increase the capacity of Inverell’s Sewage Treatment Plant – a $2.9 million project that will prepare the town for population growth and allow Inverell Shire Council to address a critical maintenance backlog. Member for Northern Tablelands Adam Marshall toured the expanding facility yesterday with Mayor Paul Harmon and council staff and said he was impressed with the speedy progress of the works. “These upgrades have been in the pipeline for some time and I’m pleased to see that progress hasn’t been slowed down despite a wet start to construction,” Mr Marshall said. “The third treatment pond has its concrete base and walls, and it’s now awaiting the installation of machinery to aerate the waste. Construction work is on schedule and should be completed before the end of the year. 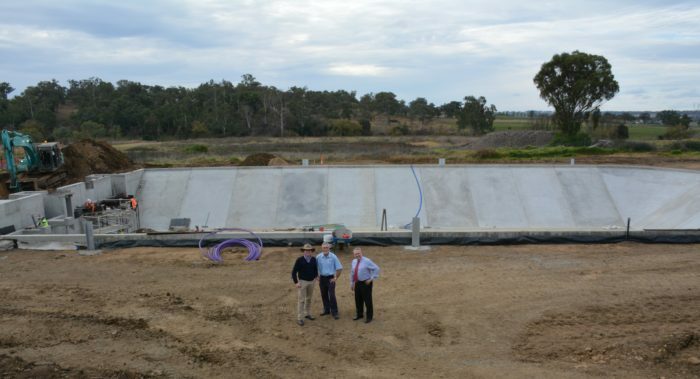 “While most people understandably don’t think about sewerage, these upgrades are critical for the Inverell community to create extra capacity as the district continues to grow. “During periods of wet weather, the current plant struggles to operate – a third treatment pond will help crews balance the load, providing a buffer for sudden downpours. “Extra capacity is desperately needed to allow council to temporarily close the existing ponds for maintenance – both ponds need urgent repairs, but it’s impossible to shut down either. Inverell’s reticulated sewerage network services residents of Inverell, Delungra, Ashford and Gilgai – with 105 kilometres of pipelines, 1,661 manholes and 19 pump heads across the shire. This upgrade will allow the network’s expansion as further subdivisions commence. “Inverell’s population growth is speeding up – with the 2016 Census indicating a 2.5% growth rate in the shire, compared to 1.6% five years earlier. This project will add an extra 50 percent capacity to the region’s sewerage treatment works, helping to ensure services will be delivered as the town and surrounding villages expand,” Mr Marshall said. The NSW Government provided a $2 million low interest loan to Inverell Shire Council to help fund the $2.9 million project. Inverell Shire Mayor Paul Harmon said the loan would mean significant savings to ratepayers. “Ratepayers will save $357,000 as a result of this low interest loan,” Cr Harmon said.